The initial reason for my recent stay in the West Bank was to make new photographs for my drawings; a friend who grew up there and who had seen my images of roads and tunnels suggested that the occupation’s impact on transportation might be interesting for me to see. I did shoot a lot of new work, but the trip was rich and challenging in other ways as well. Before planning it, my understanding of the area and the situation was limited to what I could read in the newspapers, and the only images I could remember seeing in those papers were of Palestinian youths throwing stones. But I spoke to several more artists and photographers who know both me and the place, and they told me they thought it was a good idea … and so I went. Now, I have seen enough to care about sharing some of what I saw with others. I stayed in Beit Sahour, a town next to Bethlehem, at El Beit Guesthouse. It’s run by the Arab Women’s Union, which also does humanitarian work in the community and coordinates some of the local craft workers. I found them in the Lonely Planet; I thought that staying with women would help me deal with some anticipated loneliness or disorientation. My room reminded me of one and two star pensioni in Italy, spare but clean and adequately furnished, with terrazzo floors, fluorescent lighting, and a kindly elderly lady who asked me to call if I was going to be out late, so that she wouldn’t worry. Though they have 15 rooms, I would go to breakfast every morning and find only one or two other guests. This was the case in restaurants as well, throughout my stay: tourists tend to arrive in big tour buses that leave them on Manger Square for a couple of hours, then head back to the checkpoint with the requisite stop at the gift shop. The guest house only filled just before Christmas. I chose Bethlehem because it was the one place in the West Bank I had already visited, with my father and (then future) stepmother, who is from Tel Aviv. I was around nine years old, and I have a very vivid memory of seeing the tiny doorway in the side of the Church of the Nativity and being told that this was the place Jesus was born. I couldn’t believe the door was so small and it didn’t make sense to me because I knew that Mary was supposed to be riding a donkey. Shouldn’t the door at least be tall enough for a donkey to walk through in the manger? I still don’t know, but somewhere, we have a snapshot of my brother and me riding a camel that day, grinning and a little scared because when camels get up, they send you leaning way forward then way back and we thought we were going to fall off. It will take some time for me to process the impact of this trip on my work, and it has been hard to find a voice with which to talk about what I saw there. I came as an outsider and yet people were so hospitable and welcoming, I was never made to feel like one. I felt utterly safe walking and driving around alone, day and night. This image was taken the first evening I arrived – I had walked down towards the wadi to visit Bustan Qaraaqa, where environmental activists plant trees and practice permafarming. I took two lessons in Arabic so that I could say a few basic phrases, but almost everybody spoke a little English. When they didn’t, no matter … people were patient with me and kept trying to communicate until I understood their invitation to come in for a cup of tea; in response to my request for directions, they would make a drawing or if they were going in the same direction they would hop in my car with me so they could show me the way. 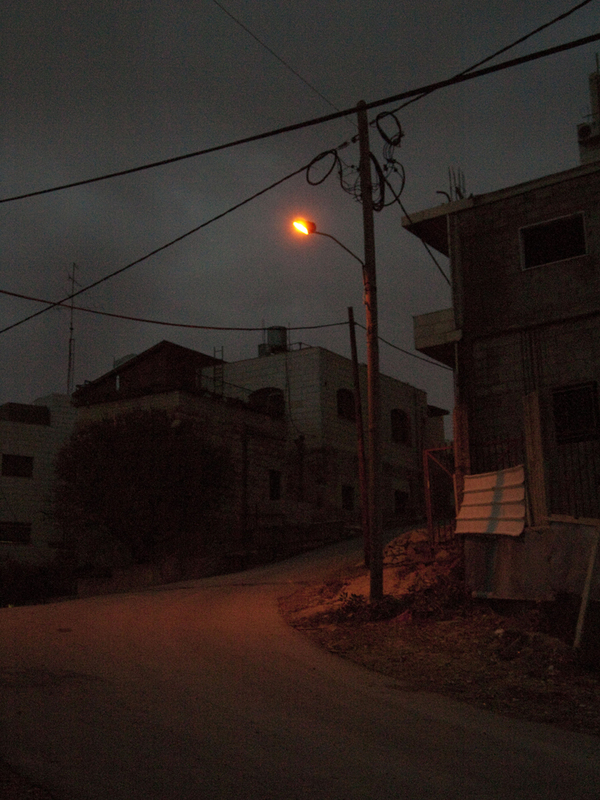 This entry was posted in Uncategorized and tagged Beit Sahour, Bethlehem, Bustan Qaraqaa, drawing, driving, El Beit, highway, Israel, map, night, Palestine, photography, road, West Bank. Bookmark the permalink.